Brass-plated and oxidized metal details. 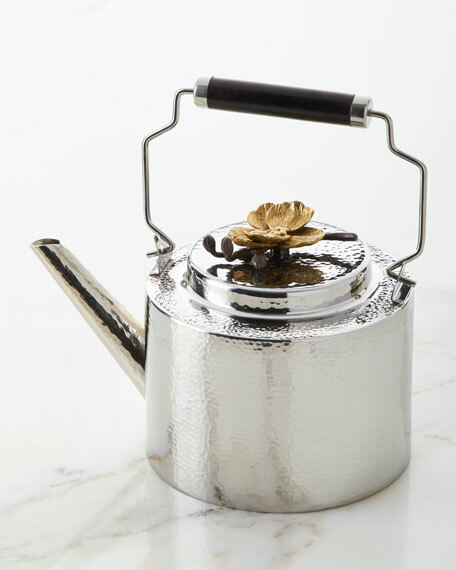 9"W x 6"D x 8.5"T.
The Michael Aram Gold Orchid Collection illuminates the ethereal spirit of the orchid flower. Evocative of happiness, strength, joy and resilience, the gold version of this beloved motif offers a strikingly unique appeal. Exuberant and detailed, in gold, these flowers take on a meaning that is completely unlike any other. There is a regal sense about this majestic flower, especially in gold ... almost as if it has been drenched in the glowing rays of the sun. "Orchids naturally emit a sense of sensuality and seductiveness, but in gold they take on a completely different meaning ... an element of radiance that I associate with positivity and optimism. When I think of gold orchids, I image this fragile flower glowing like an eternal light of joy."